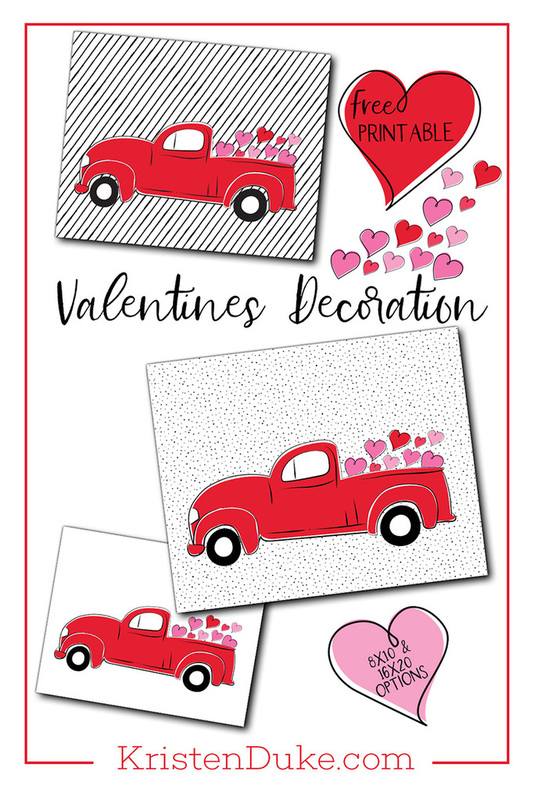 Print off this adorable red truck valentine, find a Matchbox car, and you have a fun Valentine’s Day gift! I’m not sure if you know, but I’ve got a pretty deep obsession with red trucks. Funny thing is, I don’t LOVE the color red. But the red truck with tress on top at Christmastime is kinda my favorite. So much so, that we took some family pictures around one last year. 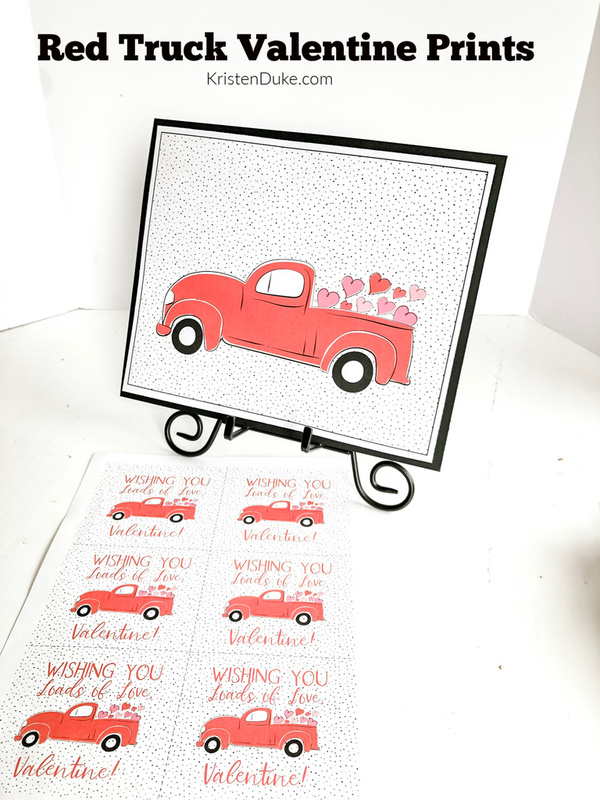 Well, that love for the red truck has trickled into Valentine’s Day with this adorable red truck valentine and wall print! 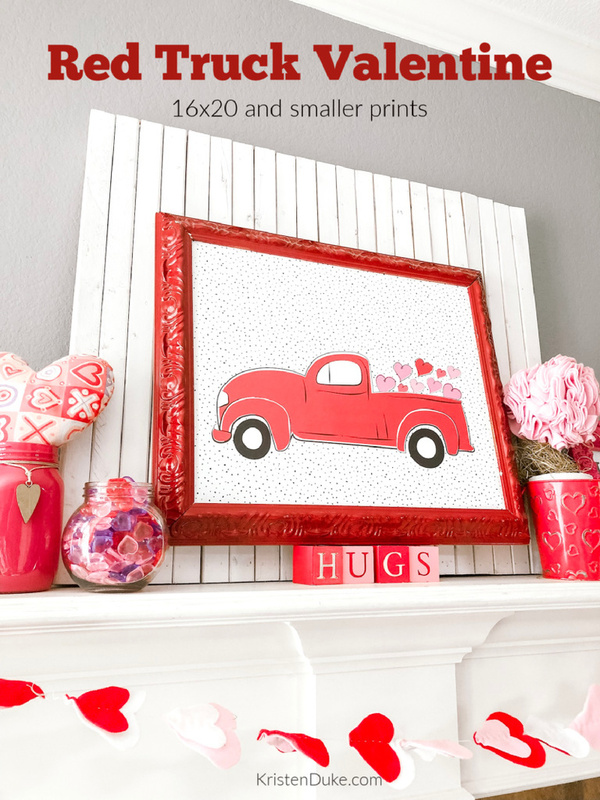 I love a good statement piece, and when putting together my Valentines mantel decoration, I knew this red truck valentine print would be the perfect centerpiece. Even if you don’t want the large 16×20 print, you can print it as a small tabletop size, and place it on an easel. 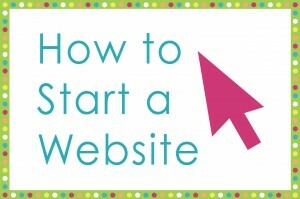 I print it on cardstock, back it with black or red and place on an easel. Options! There are THREE different ways to print the big red truck valentine print: stripes in the background, dots, or solid white. 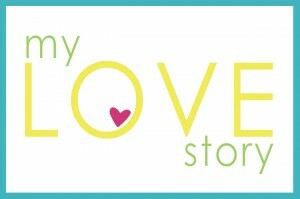 Lastly, I made the same cute print into printable valentine cards. There are 6 to a page and say wishing you loads of love Valentine. 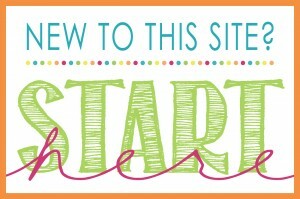 These would be so cute for your kids to pass out in class to their friends! Or for you to give to your family on Valentine’s Day. 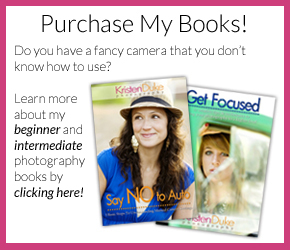 Then you can print them on your home computer or send them to your favorite print shop or photo developer. Did you know that at Sam’s Club (and maybe even Costco) it’s only $7 to print a 16×20? Yeah, fairly inexpensive for a big statement piece for your fireplace mantle!